I decided to go back to the regular pen and ink for this drawing. The Elegant Writer Pen has been a fun experiment, but I wanted to do some more detailed work again. This is a very elaborate, large oaken wooden door surrounded by dusty rose framing and trim. There is stucco above with some timber work and to the sides. There is a lot of detail with this piece and the inking is going to take a while. I hope the old eyeballs can keep it all straight. I haven’t decided whether to use the pastels or the watercolors. 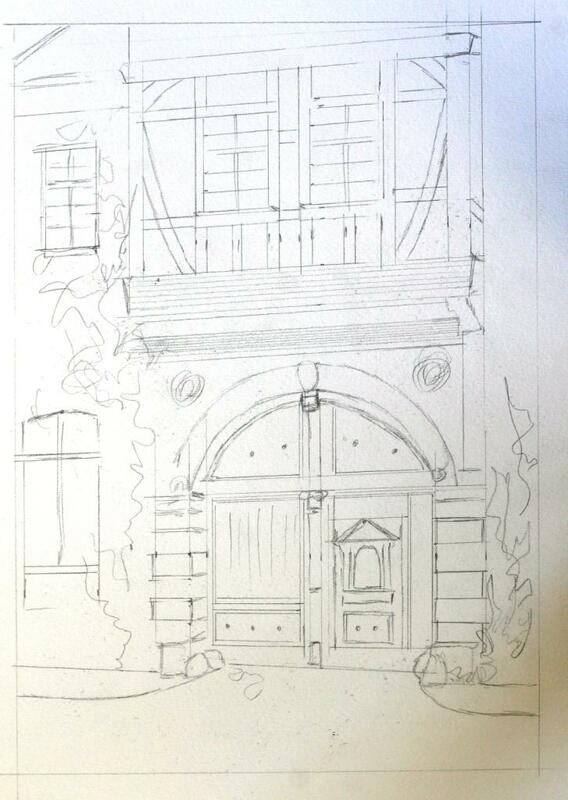 The richness of the door colors has me leaning towards the pastels, but I’ll decide when the inking is finished. I went ahead and used the yellow umber for the stucco. In the spirit of the past vivid wall coverings, the light beige just seemed too plain. There were nice touches of red in the window frames and I added some red flowers next to the stone wall. 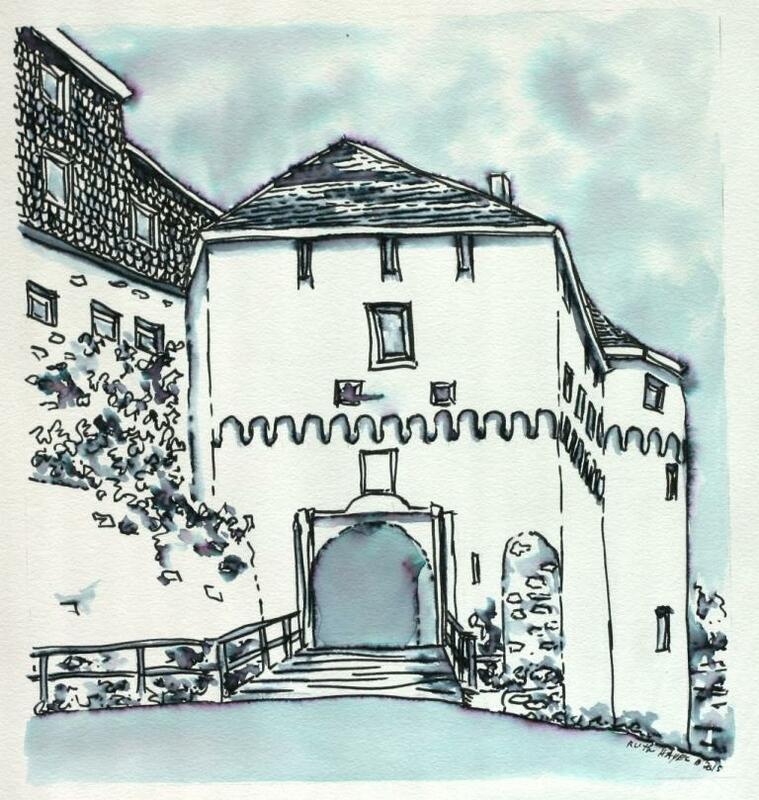 Since these castles are usually built high up on the mountainside or riverside you often see a panoramic view of the country beyond the walls. My son just came back from a business trip to Germany last month so I hope to have more pictures to work from. 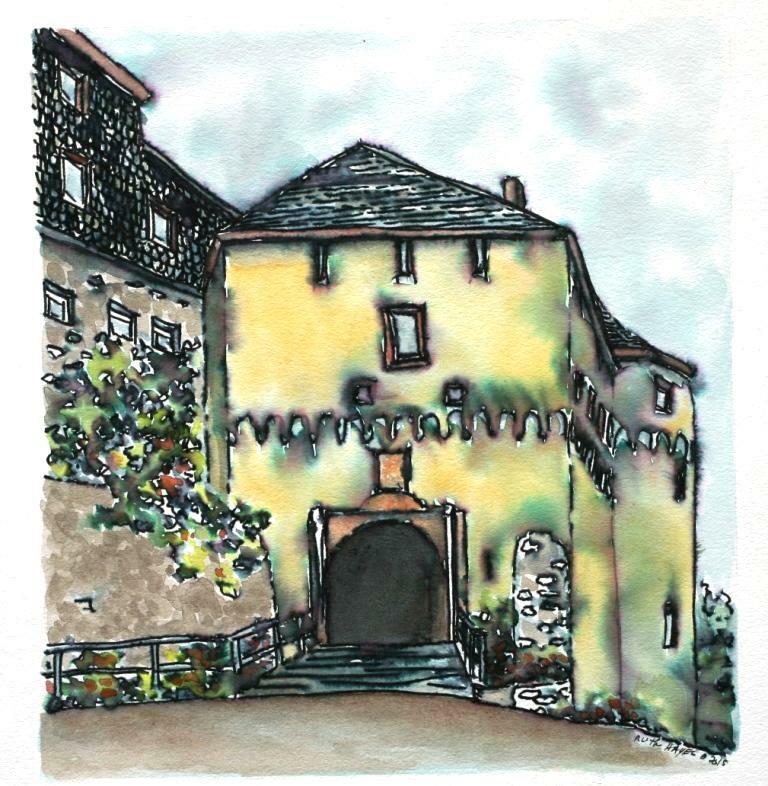 I think I will try a few with just regular pen and ink and watercolors or pastels. 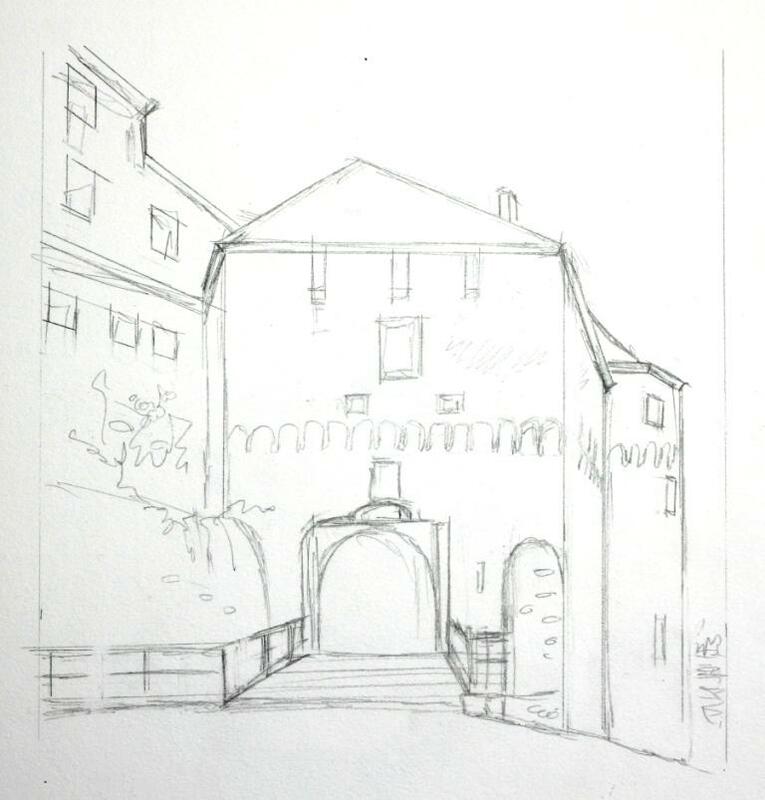 Old World buildings are just too much fun to draw. Modern architecture rarely has the intricate detail work seen from centuries back and I think that is a shame. Well, miracle of miracles, we met up with our German shepherd stray ‘s owners yesterday and were able to return her to her proper home. She lived about 2 miles down the road and somehow managed to make it to our deck and park herself here for the week. A friend of the wife saw the notice I put on the Owen County facebook page and they called Monday. We weren’t sure it was the right dog because they said a younger age than my vet thought and the facial markings were off a little in the picture she sent, but we agreed everyone would feel better if they took a look. Sure enough, it was their dog. Everybody went home happy. The funny part is that I couldn’t decide between the name Sadie or Sophie. Neither one seemed quite right. Her real name is Shadow. Pretty close if you ask me, for a shot in the dark. 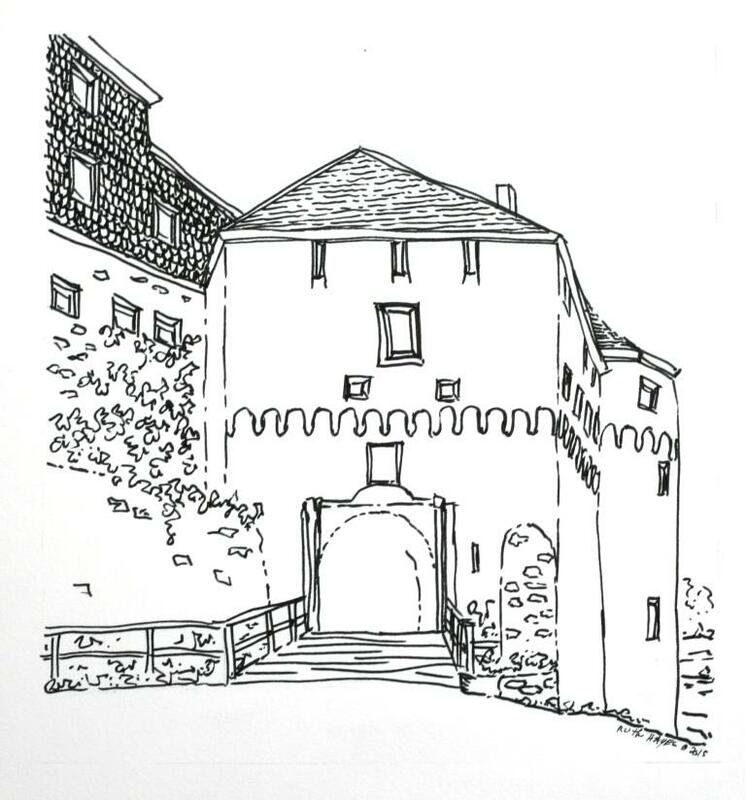 In the meantime, I inked up the castle entryway. It has a plain stucco wall for the entry area and rear turret, red window trim and some sort of wooden shingle above the lower stone. There is a little bit of greenery growing on the stone bases, which will add some nice colors. Washes up next. I think I took this photo at the Marksburg castle in Germany. At least it was in the Marksburg section of my photos, one of the few documented areas in the trip album. LOL If I remember correctly, this particular castle was one of the few that escaped damage from Napoleon’s cannons because its hillside location was just out of range. We went on a castle tour and it was fun to get the scale of higher class living in the middle ages. The interior was much smaller than I imagined it would be but that is probably due to all of the medieval castle movies I have seen. It actually was quite beautiful inside the living areas. The furniture was small and somewhat sparse but the fabrics pretty. The rooms seemed to be very close together and more intimate than I imagined they would be. I suspect that might be due to considerations for warmth in the winter. I do remember the “indoor plumbing” was a cold little room that had an open air bottom under the bench seat. That must have been a bit chilly in winter weather. There was a small towered area with very limited access which I can’t remember whether it was a safe area for the family or a prisoner tower. I think this might be the main entryway into the castle, where the horsemen and wagons came in. Stables were off to the side of the interior courtyard, as was a prisoner area. Other than that, I don’t remember a great deal. I wish I had taken more interior shots to jog my memory. As a souvenir, we brought back a small reproduction sword in the luggage. The German screeners got quite the chuckle over that. I’m sure they were thinking “American tourists”. Guess what showed up on my deck again two days ago. You guessed it – another German shepherd. 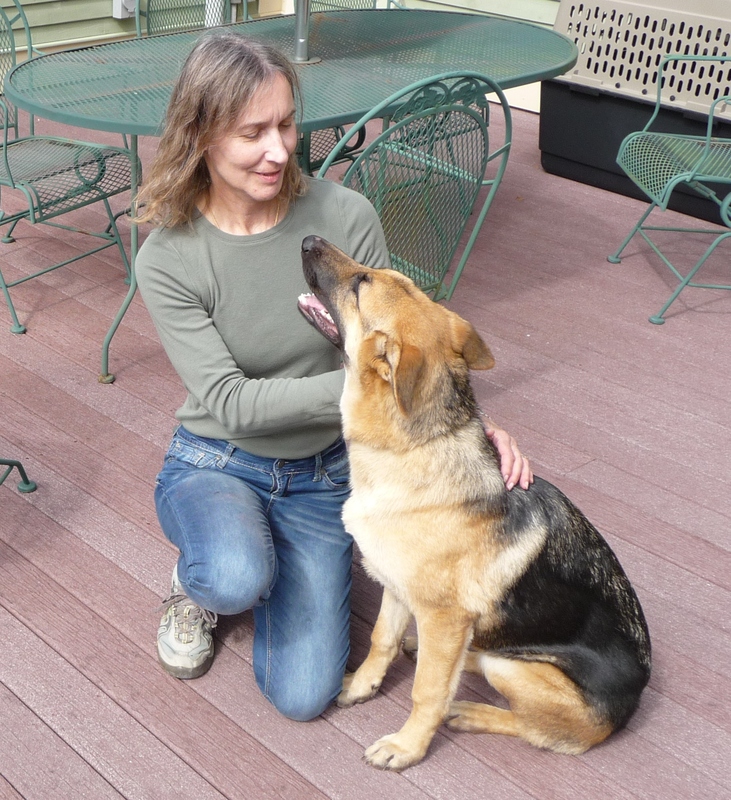 Two years after our adventure with Alex, the long haired German shepherd puppy, another one showed up on the back deck. She is very sweet and about a year old. She has none of the dominance issues that Alex had and seems to have quite a nice, submissive temperament. She seems quite intelligent and trainable at this point. We are looking for her owners but maybe she will just be staying here. I ended up taking off the last week or so. After 3 home portraits in a row, on a quick schedule, I decided I needed a short break. Back to work really soon.